SunTide Canada Slots | Play for Free, No Download Required! 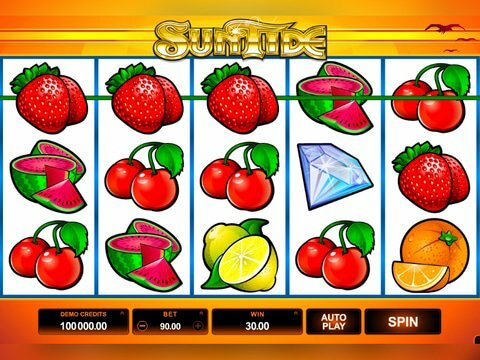 SunTide slot machine has a bright summer theme and a top pay of $180,000. The new addition to the Microgaming library is playable on desktop, laptop and mobile devices and features 5 reels and 9 paylines. Together with scatters and free spins, there are expanding wild reels to push up the payout percentage. Read the full review to find out how the gold coin can bump your bank balance into the black. Alternatively, you can give the reels a spin of SunTide free play slot available in the no download demo on this page. There is no registration to submit - simply enjoy complementary play at your fingertips! Thereafter, you're invited to Jackpot City casino, a favourite destination for Canadians that offers an exclusive no deposit bonus as a free ticket to the best casino games available online! With a betting range of between $0.09 and $22.50 per spin, SunTide slot machine is tailored for betting beginners and high rollers. Payouts are multiples of your line bet. Wager top dollar and you'll be similarly rewarded with real money prizes that soar to $180k, that's 8,000x the maximum wager. Had you bet $0.09 per spin instead, your winnings would dive to just $720 for exactly the same line win combination. In addition to the base game payouts, there are special symbols that can improve the chances of multiple wins. Keep reading the review for an account of the bonus features, or fire up the no download, no registration free play demo for a real-time peek at the action! The major money spinner in SunTide slot machine is the gold coin wild. In the base game, it expands on the middle reel and substitutes all other standard symbols to generate line wins. Hit three or more scatters anywhere onscreen and you'll activate 15 free spins. During the free game time, the wild has the capacity to expand across any of the three middle reels to deliver potential winnings of up to 3,333x your stake. The free spins feature can be re-activated to grant up to 30 free spins, providing Canadians infinite opportunities to bank the big one! Virtually every software provider has at least one summer slot and Playtech is no different. Amongst their vast games library you'll discover Beach Life, a 5 reel and 20 payline progressive jackpot slot with a pick me bonus game, wilds and scatters to sweeten the deal. Hitting the jackpot is tricky at best as you have to land five wilds on the 20th payline. Thereafter, there's a top pay of $20,000. If you look at the regular base-game payouts, the one offered in SunTide slot machine is 9 times higher than Beach Life!